Today I welcome Coreena McBurnie to the blog to tell us a little bit about her writing, including her latest release, Prophecy. 1) Tell us about your latest release. My book is called Prophecy and is the first book in the Antigone: The True Story Series. 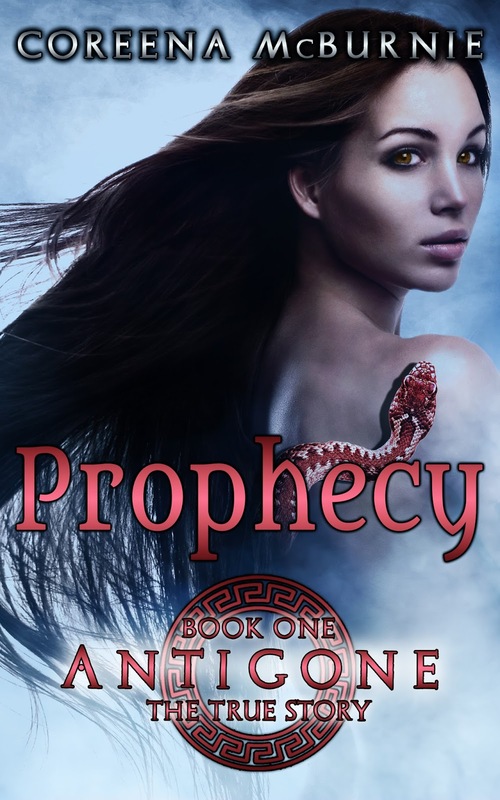 Prophecy is a young adult, historical fiction novel set in ancient Greece. It is the story of Antigone, the daughter of King Oedipus (the one who killed his father, married his mother, then blinded himself). Antigone is a heroine faced with impossible choices -- the gods want her to study at the temple, the snakes call her their princess, her parents want her to marry for political gain and to learn to run a household, she wants to help her city which is getting decimated by the plague, she falls in love with someone she cannot marry -- but the choices she makes define who she is and what she's willing to fight for. Antigone has to decide where her true duty lies. 2) Do you have a favourite moment in the story? Why? Yes, I love the scene where the current kings have called on the blind prophet, Teiresias, to tell them who murdered King Laius, the previous king. The oracle has told them that if they exile the murderer, the plague will be lifted from the city. Teiresias refuses at first to give the name and plays word games with them. It is one of those scenes where I felt like everything came together and I could even feel tingles up my spine because it really worked. And it wasn't even wholly planned, it simply flowed. 3) Do you have a favourite character from any of your stories? Why? I love Antigone. I've loved the character of Antigone since I first read Sophocles' ancient Greek play Antigone way back in first year university. Antigone is unique in Greek myth because she is strong and stands up for what she believes is right, which is unusual for a woman. I've tried to take that same spirit of being fallible because of her pride and sense of duty, but completely admiring how true she is to her values and turn her into a character for a modern audience. 4) Tell us about your writing process. To be honest, I am all over the place when I write. I don't use an outline and I don't write every day, though I do try to do something towards my writing every day, though I break it up into small chunks. I do most of my actual new writing in Novembers during National Novel Writing Month (a challenge to write 50,000 words in November), then I spend months after that re-writing and editing what I've written. I take lots and lots of baby steps which add up daily into a book. 5) From where do you draw your inspiration? Mostly I draw on ancient cultures and stories. Even when I've written stories set in modern times, I find myself using ancient themes, maybe because they are universal -- and because I love them so much. I am also inspired when I read books by other authors. I love well crafted sentences and images and sometimes I re-read them simply to let them soak in and hope that I can use that energy to recreate well crafted sentences and images in my own writing. 6) Is there a genre you've not written yet that you'd like to try? Yes, lately I've really been drawn to speculative fiction. I've been mulling it over for several months now. I love the idea of characters being pushed in ways that reveal their true characters or explores different aspects of humanity. I'm thinking of turning some of these ideas into short stories to start with. 7) What are the best and worse things about being a writer? It is so exhilarating when I write a scene that really comes together, or when I've found I've foreshadowed things and didn't even realize it at the time -- those times when synchronicity seems to take over and everything works. The worst part is the self doubt, that constant feeling that my book isn't all that good after all and I should have edited it some more. 8) Who are your favourite authors? What are some of your favourite books? One of my favourite books of all time is Douglas Adams' The Hitchhiker's Guide to the Galaxy -- it's hilarious and so revealing about humanity. I also love Kristin Cashore's Graceling and Maria V. Snyder's Poison Study series. Then there's Christopher Moore, JK Rowling, Maeve Binchey, Dostoyevski. Then there's The Odyssey by Homer -- so much adventure and tales of heroism. 9) Tell us a little known fact about yourself. In university I went on an archaeological dig of a Roman fort in central England called The Lunt (near Coventry). 10) What's next for you and your writing? Right now I'm working on Fate, Book 2 of the Antigone series, as well as an adult novel about Clytemnestra (Helen of Troy's sister). Coreena loves Greek myths and ancient cultures and is in a unique position to tell this tale, having earned a Bachelor's and a Master's degree in Classical Studies. Prophecy, Book 1 in Antigone: The True Story series, is her first published novel. 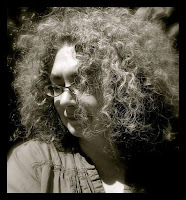 She does most of her writing in Novembers during Nanowrimo and spends the rest of the year editing and reading. She lives in BC, Canada with her husband, three kids, and their cat.